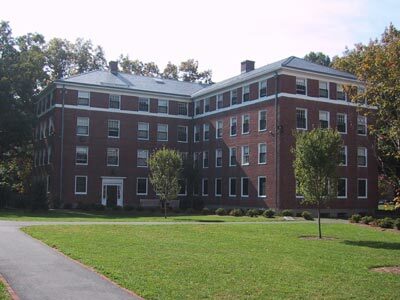 Stearns Hall was named for the Stearns family; the grandfather, President Stearns, the father, William F., and the son, the head of the Board of Trustees at the time of the construction of the dormitory, Alfred E. (King, 276). Like James Hall next door, Stearns is slated for demolition in the coming years, to be replaced by a more spacious (and better-appointed) freshman dormitory. (Photo taken 12 October 2001).